Well...not sure where to begin with this train wreck of a movie. I was certainly not particularly looking forward to a movie from the 50s about the circus, but I thought it just might be an interesting insight into the circus world. The one up side of this movie is the bit of inside look into the circus as a documentary portion of the film, but the rest of the movie was very dull and boring. The movie's focus is around Brad, played by Charlton 'From my cold dead hands' Heston, who manages the Ringling Brothers circus and his love affair with his center ring trapeze flyer Holly. But Brad decides to hire “The Great Sebastien,” and once the ‘debonair of the air’ arrives he is put into the center ring and the main act thus displacing Holly; inevitably leading to major trapeze flyer issues and in-fighting between Holly and Sebastien. Eventually a strange love triangle develops between Brad, Holly, and Sebastien where the trapeze artists are falling in love, but are still trying to one up each other by doing more elaborate and dangerous stunts. A few other cursory plot lines develop, although nothing significant, frankly the main plot line focusing on Brad, Holly, and Sebastien only makes up a very small portion of the movie time maybe about 20 or 30 minutes. 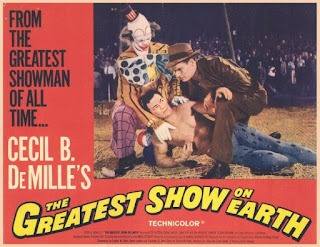 The bulk of the movie seemed to be focus on seeing the circus at work, including the various circus acts (including trapeze artists, elephants, clowns, etc. ), and documentary style portions showing how the circus moves around the country as it was actually moving around the USA, the set up, take down, and everything in between. Frankly that was interesting, it would have been nice to see a full documentary on the inner workings of the circus in the 50s rather than wasting our time with the awful plot. Something that was really interesting is that according to what Shannon looked up, the actors who played Holly and Sebastien actually learned how to do the various trapeze acts, they didn’t use stunt doubles or special effects available in the 50s. Although that doesn’t specifically add to the overall enjoyment, it does make the actors stand out more in the film for their desire to really put themselves into the show, but even with that, the film is a huge bore. I didn't have high hopes for this movie. I know Kurt was thinking it might be another "The Great Zeigfeld", and while it had all the spectacle, I just didn't care. Granted, I didn't care about Zeigfeld, either, but this movie had only the lamest of plots holding it together. Essentially, it's a documentary on the Barnum and Bailey Ringling Brothers Circus, with a ridiculous story trying to tie the bits together. I guess they didn't believe in documentaries back then. It's a shame, because the best part of the movie was seeing what circuses were like in their heyday. Even by the time I was a kid in the 80s, circuses had changed a lot. I'm not saying that's a bad thing (the poor elephants), but just that I had no idea what a "real" circus was like. I can see how they won the moniker of "Greatest Show on Earth". This movie was filmed on location/tour with a real circus... even the actors learned the acts in order to do their own stunts. Too bad they couldn't learn to act.